Are acne eruptions bothering you? Are you wondering how to treat recurring acne for good? If you are longing for ways to get back your clear and glowing skin, you must read this. Acne is a common skin problem that many people face. It is usually caused by excessive production of sebum and the dead skin cells due to hormonal changes that take place during teenage, or due to excessive exposure to pollution, allergic reactions to dust or some foods; during pregnancy or post delivery. The common areas that are affected by acne or pimples are neck, cheeks, forehead, shoulder, chest, and nose. However, it is possible to treat acne with some effective and simple, day-to-day items which are found handy in your kitchen. Honey is a great natural remedy for treating acne. The stickiness of honey helps to remove the excess dirt and dead skin cells from the skin. Take a cotton ball and dip it in honey. Apply evenly on your face and leave it for one hour. Wash it with cold water and pat dry for best results. For best results you can do this procedure 3 to 4 times in a week. Toothpaste helps in treating pimples and removing the scars formed by pimples. Take some toothpaste on a cotton ball. This remedy will help you to remove the scars which are formed by the acnes. You can do it once a week to have a clear skin. The astringent and exfoliating properties of lemon makes it an amazing ingredient to treat acnes and its scars. In a small bowl, take equal quantities of rose water and lemon juice. Mix well and apply it on the affected area with a cotton ball. Leave it for one hour and then wash your face. You can repeat this procedure whenever you get pimples on your face. This will help you to get rid of pimples very quickly. Garlic is known to treat the acnes because of its anti-inflammatory and antibiotic properties. It is very effective remedy in reducing the swelling and redness that comes with acne. Take a garlic clove and peel it. Rub the peeled garlic clove directly on the affected area. Keep it for 15 minutes and wash it off. This remedy is very effective when you have fresh pimples and can be used whenever you have one. Aloe vera gel is usually used to treat acne due to its antibacterial properties. It has soothing effect on the skin and also helps in reducing inflammation of pimples. Take an aloe vera leaf and slit it in the middle. Scrap the gel and apply it on the affected area generously. Let it dry and then wash it with cold water. You can apply this remedy three to four times in a week since it is very soothing for your skin. Mint helps to remove pore clogging oil. Yogurt has soothing properties which are very effective on your skin. Mix the chopped mint leaves along with yogurt and oatmeal powder. Apply it on your face and leave it for 15 minutes. You can use this remedy for 2 to 3 times a week for best results. Apple cider vinegar contains malic and lactic acids that can exfoliate your skin, reduce red marks, and treat pimples as well. Take a small bowl and mix equal quantities of apple cider vinegar and water. Mix it well and apply it evenly with a cotton ball. You can use this remedy for 3 times a week for better results. You can also mix this and store it in a bottle for regular use. Make sure you shake well before every use. Powdered almonds work well to exfoliate your skin and they also help to absorb excess oils and impurities from your skin. In a small bowl, mix all the ingredients well. Dip a cotton ball and apply it on your face evenly in circular motions. Rinse it with water and pat dry. You can use this remedy as a scrub for your face and it will give you a clear skin. You can use this remedy around 4 times a week. Tomatoes are a very effective and a common remedy for acnes. The acids in the tomatoes help to absorb the excess oil from the skin and keeps the pores clean. In a small bowl, mix the tomato pulp and sugar well. Let it dry for 10 minutes and wash it off. You can use this procedure 3 to 4 times a week for best results and keep your skin glowing and clear. Baking soda is an amazing home remedy to get rid of pimples on greasy skin. It helps to exfoliate the skin to remove dirt, dust and dead skin cells. In a small bowl, add baking soda and required quantity of water and mix well to form a thick paste. Apply this paste on the affected area on your face and keep it for 5 to 7 minutes. 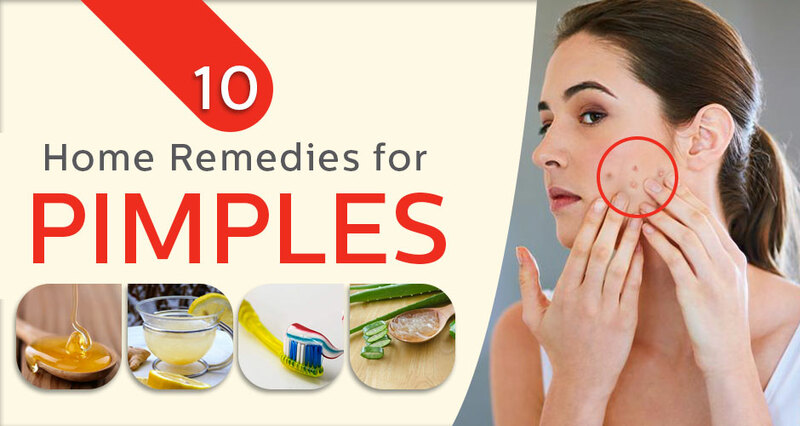 You can repeat this process whenever you have fresh pimples on your skin. For best results use it twice a day.